A nice selction of Firearms, Ammo, and Militaria. Sales Tax : 7% - Sales tax applied to invoice total, including Internet Premium, Convenience Fee. Payment Instructions: Your credit card will be charged for your purchases immediately following the auction unless arrangements for alternate payment arrangements are made PRIOR to the auction. The online buyers premium is 15%, plus 3% convenience fee. Shipping Instructions: It is the responsibility of the purchaser to pay for shipment of purchase. Shipping performed by Pack & Send Plus. A Pack & Send+ rep will contact buyer to notify of charges and collect shipping payment. Ship-to address listed on Proxibid will be used for shipping. Contact Pack & Send Plus at 802-560-4111 Qualified (non-FFL)non-freight items not picked up by specified removal times will be processed for shipping. Buyer will need to provide for guns: All firearms will be shipped to a FFL gundealer of the buyer's choice from Thomas Hirchak Co. Shipping includes $500 insurance, Additional Insurance will be at purchasers expense. All buyers will need to provide to Thomas Hirchak Company the contact and shipping information for their dealer and the buyer's dealer is responsible for ALL necessary paperwork for firearm purchases. Email FFL Information to FFL@THCAuction.com or fax to 802-888-2211. Please be sure to include your paddle ID #. Driving Directions: 131 Dorset Lane, Williston, Vermont . I89 exit 12, take Route2A north for 2.3 miles, left onto J. Brown Drive, left on Dorset Lane, Auction gallery is on the left. Thank you for participating in a Thomas Hirchak Company Online Auction. It is important that you become familiar with the terms and conditions as all sales are final. The terms of sale are non-negotiable. 15% Buyers Premium, 3% Convenience Fee All FFL Buyers please bring a copy of current license. All non-FFL purchasers must pass national instant background check screening. No direct sales to out-of-state buyers without FFL if not permitted by their state of residence. All purchasers of firearms must present valid government issued photo identification; the government allows no exceptions. Photo ID must have physical street address; a P.O. boxes is not an acceptable address. Purchasers must be at least 21 years old to purchase firearms and ammunition. Hand guns may only be delivered to FFL holders and residents of the state of Vermont. All out of state hand gun purchases must be shipped to an FFL within the purchaser?s state of residence. FFL Transfer request form available at THCAuction.com. WE DO NOT EXPORT FIREARMS OUTSIDE THE U.S. Registration at the auction (online and/or in person) finalizes each bidder's agreement to the terms and conditions of sale as stated in the Contract and any Addenda which are incorporated by reference into your bidding. Do not bid until you have read the terms and conditions. In order to bid at the auction all Bidders must be signed up and register to bid through Proxibid.com. There is no fee to register although a valid credit card will be required to verify identity and funds. By bidding you are representing to Thomas Hirchak Company (Auctioneer) and the seller that you have read and agree to be bound by the terms and conditions for this sale as stated herein. If you do not agree with any of the terms and conditions stated DO NOT BID or you will be bound by those terms and conditions. By bidding you agree to all disclosures. THE SALE WILL BE CONTROLLED BY THE AUCTIONEER PROGRAM. Thomas Hirchak Company is not responsible for malfunctions or system errors which cause a bid or bidder to fail to be recognized or registered. If there is a dispute, the Auctioneer may re-open the bidding at the Auctioneer's sole discretion and shall serve as the sole arbiter as to who is or is not allowed to bid. Thomas Hirchak Co. does not guarantee serviceability of items sold and recommend that all items be checked by a certified gunsmith prior to firing. Ammunition is sold as components only and Thomas Hirchak Company is not liable in any way for any issues that may arise from its use. It is the bidders responsibility to know and follow their own state laws pertaining to firearms and ammunition. If your state lists your purchased firearm on their banned list we cannot ship it to another state. Winning bidder relinquishes all claims on said items. There will be no refunds of any kind. Winning bidders items will be sold at a later date and time of Thomas Hirchak Company choosing with no minimum no reserve. There will be a 20% seller’s fee incurred. FFL'S and back ground checks. Within 5 days of auction end winning bidders must provide a current valid copy of the receiving dealer's FFL or receive an approval via our NICS/ATF 4473 background check. If for any reason a winning bidder fails their background check Thomas Hirchak Company will grant a 15 day period to rectify the situation and pass a NICS background check. There will be no refunds if you fail to pass a NICS background check or provide a current FFL. 15 days after the end of the auction if the background/FFL criteria have not been met, Thomas Hirchak will sell the purchased items in their next auction with no minimum bid or reserve price. The net proceeds of the resell price less a 20% commission will be sent 10 days after the auction. Firearms are sold 'AS IS, WHERE IS' with no financing, inspection or other contingencies to sale. Thomas Hirchak Company represents the Sellers only and does not inspect properties on bidder's behalf. Buyers must conduct their own due diligence and investigation of each property and must also investigate the suitability of each parcel prior to making a bid and purchase at the auction. Buyers must rely solely upon their own investigation and not any information provided by the Seller or Auctioneer. Failure of a Buyer to be fully informed on the condition of a property will not constitute grounds for any claim adjustment or right to cancel sale. YOU ARE ENTERING INTO A BINDING CONTRACT. THERE ARE NO REFUNDS OR BID CANCELLATIONS. THE REGISTERED BIDDER IS PERSONALLY RESPONSIBLE, LEGALLY AND FINANCIALLY FOR ALL AUCTION ITEMS BID UPON WHETHER REPRESENTING ONE'S SELF OR ACTING AS AN AGENT. AN ONLINE BID ACCEPTED AT PUBLIC AUCTION IS A LEGAL AND BINDING CONTRACT TO PURCHASE. 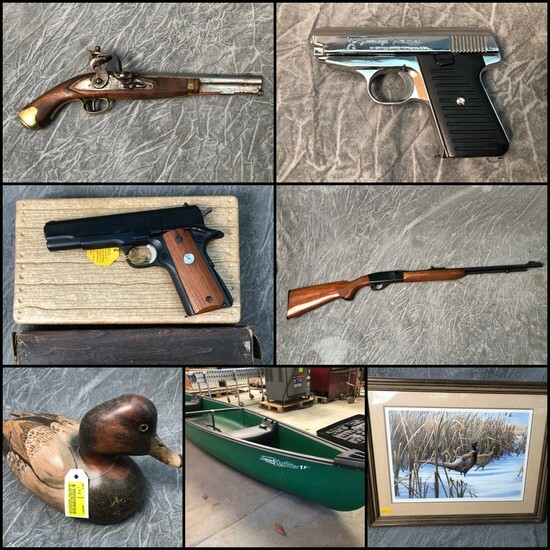 ANY BIDDER WHO FAILS TO CONSUMATE A PURCHASE WILL BE BANNED FROM BIDDING AT ALL FUTURE SELLER AUCTION EVENTS AND MAY BE PURSUED FOR CIVIL AND/OR CRIMINAL VIOLATIONS. You've been outbid to O****3! to YOU! You've been outbid to o****t! to YOU! You've been outbid to x****4! to YOU! You've been outbid to j****5! to YOU! You've been outbid to s****5! to YOU! You've been outbid to f****s! to YOU! You've been outbid to C****c! to YOU!